Recurrent aphthous stomatitis (RAS) is a common ulcerative inflammatory condition of the oral cavity; it typically starts in childhood or adolescence as small recurrent, painful, round or ovoid ulcers with well-defined erythematous margins, like a halo, and a central yellow or gray floor. Recurrent aphthous ulcer with well-defined erythematous halo and central yellowish gray base, on left anterolateral tongue. Traumatic ulcer on ventrum/lateral margin of tongue; these must be differentiated from aphthae. Diagnosis of RAS is based on history and clinical features. Topical corticosteroids (TCs) remain the mainstays of treatment. If RAS fails to respond to local measures, systemic immunomodulators may be required. A wide spectrum of agents has been suggested as beneficial, but few studies have been performed to assess the efficacy of these drugs (or their adverse effects are significant). Despite many studies trying to identify a causal microorganism, RAS does not appear to be infectious, contagious, or sexually transmitted. Immune mechanisms appear to be at play in persons with a genetic predisposition to oral ulceration. A genetic basis exists for some RAS. This is shown by a positive family history in about one-third of patients with RAS; an increased frequency of human leukocyte antigen (HLA) types A2, A11, B12, and DR2; and susceptibility to RAS, which segregates in families in association with HLA haplotypes. RAS probably involves cell-mediated mechanisms, but the precise immunopathogenesis remains unclear. Phagocytic and cytotoxic T cells probably aid in destruction of oral epithelium that is directed and sustained by local cytokine release. Patients with active RAS have an increased proportion of gamma-delta T cells compared with control subjects and patients with inactive RAS. Gamma-delta T cells may be involved in antibody-dependent cell mediated cytotoxicity (ADCC). Compared with control subjects, individuals with RAS have raised serum levels of cytokines such as interleukin (IL)–6 and IL-2R, soluble intercellular adhesion modules (ICAM), vascular cell adhesion modules (VCAM), and E-selectin; however, some of these do not correlate with disease activity. Stress - This underlies RAS in some cases; ulcers appear to exacerbate during school or university examination times. Trauma - Biting of the mucosa and wearing of dental appliances may lead to some ulcers; RAS is uncommon on keratinized mucosae. Endocrine factors in some women - RAS is clearly related to the progestogen level fall in the luteal phase of the menstrual cycle, and ulcers may then temporarily regress in pregnancy. Cessation of smoking - This may precipitate or exacerbate RAS in some cases. Allergies to food - Food allergies occasionally underlie RAS; the prevalence of atopy is high. Patients with aphthae may occasionally have a reaction to cow's milk and may have been weaned at an early age. Sodium lauryl sulfate (SLS): This is a detergent in some oral healthcare products that may aggravate or produce oral ulceration. Most patients with RAS are otherwise healthy. Minor aphthous ulcers (MiAUs) are usually self-limiting, with the usual duration being about 10-14 days without any active treatment. Major aphthous ulcers (MjAUs) can last up to about a month. A third type of RAS, the herpetiform ulcers, are devastating, lasting from 10 days to about 100 days. Ulcers respond well to topical medications, although sometimes a systemic medication may be necessary. Patient education regarding this condition may facilitate early treatment during prodromal phases to minimize the discomfort. Children with extensive ulcers should receive proper diet and hydration, as they may avoid food intake as well as hydration. When using palliative measures such as topical numbing medication, the patient must be cautioned against trauma to anesthetized areas while eating or sleeping. The patient should avoid precipitating factors, such as allergens, trauma, and other potential triggers. For patient education resources, see the Oral Health Center, as well as Canker Sores. Akintoye SO, Greenberg MS. Recurrent aphthous stomatitis. Dent Clin North Am. 2014 Apr. 58 (2):281-97. [Medline]. [Full Text]. Scully C. Myths or legends and RAS. Oral Dis. 2012 Jul. 18(5):521; author reply 520. [Medline]. Preeti L, Magesh K, Rajkumar K, Karthik R. Recurrent aphthous stomatitis. J Oral Maxillofac Pathol. 2011 Sep. 15(3):252-6. [Medline]. [Full Text]. 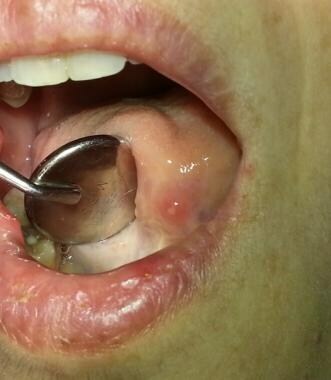 Shotts RH, Scully C, Avery CM, Porter SR. Nicorandil-induced severe oral ulceration: a newly recognized drug reaction. Oral Surg Oral Med Oral Pathol Oral Radiol Endod. 1999 Jun. 87(6):706-7. [Medline]. Gulseren D, Hapa A, Ersoy-Evans S, Elcin G, Karaduman A. Is there a role of food additives in recurrent aphthous stomatitis? A prospective study with patch testing. Int J Dermatol. 2016 Dec 30. [Medline]. Zhang Z, Li S, Fang H. Enzymatic antioxidants status in patients with recurrent aphthous stomatitis. J Oral Pathol Med. 2017 Jan 5. [Medline]. Gülseren D, Karaduman A, Kutsal D, Nohutcu RM. The relationship between recurrent aphthous stomatitis, and periodontal disease and Helicobacter Pylori infection. Clin Oral Investig. 2016 Jan 6. [Medline]. Hijazi K, Lowe T, Meharg C, et al. Mucosal Microbiome in Patients with Recurrent Aphthous Stomatitis. J Dent Res. 2014 Dec 24. [Medline]. Kim YJ, Choi YS, Baek KJ, Yoon SH, Park HK, Choi Y. Mucosal and salivary microbiota associated with recurrent aphthous stomatitis. BMC Microbiol. 2016 Apr 1. 16 Suppl 1:57. [Medline]. [Full Text]. Volkov I, Rudoy I, Freud T, et al. Effectiveness of vitamin B12 in treating recurrent aphthous stomatitis: a randomized, double-blind, placebo-controlled trial. J Am Board Fam Med. 2009 Jan-Feb. 22 (1):9-16. [Medline]. [Full Text]. Albrektson M, Hedström L, Bergh H. Recurrent aphthous stomatitis and pain management with low-level laser therapy: a randomized controlled trial. Oral Surg Oral Med Oral Pathol Oral Radiol. 2014 May. 117(5):590-4. [Medline]. Liu C, Zhou Z, Liu G, Wang Q, Chen J, Wang L, et al. Efficacy and safety of dexamethasone ointment on recurrent aphthous ulceration. Am J Med. 2012 Mar. 125(3):292-301. [Medline]. Tecco S, Sciara S, Pantaleo G, et al. The association between minor recurrent aphthous stomatitis (RAS), children's poor oral condition, and underlying negative psychosocial habits and attitudes towards oral hygiene. BMC Pediatr. 2018 Apr 13. 18 (1):136. [Medline]. [Full Text]. Chen L, Ke Z, Zhou Z, Jiang X, Zhao Y, Zhang J. Associations of IL-1, 6, and 10 Gene Polymorphisms with Susceptibility to Recurrent Aphthous Stomatitis: Insights from a Meta-Analysis. Genet Test Mol Biomarkers. 2018 Apr. 22 (4):237-45. [Medline]. Wu J, Wang W. Association between interleukin family gene polymorphisms and recurrent aphthous stomatitis risk. Genes Immun. 2018 Mar 18. [Medline]. Recurrent aphthae in floor of mouth, showing ovoid ulcer with inflammatory halo. Typical aphthous ulcer in a common site, showing inflammatory halo surrounding a yellowish round ulcer. Recurrent aphthous stomatitis with ulcers of varying sizes - large ulcers on the right buccal mucosa and a small ulcer on the anterior tongue.